The duration and rhythm of effective CPD support requires a longer-term focus – at least two terms to a year or longer is most effective, with follow up, consolidation and support activities built in. Participants’ needs should be carefully considered – this requires stepping away from a ‘one size fits all’ approach and creating content for teachers that integrates their day-to-day experiences and aspirations for their pupils with a shared and powerful sense of purpose. Alignment of professional development processes, content and activities – ensuring there is a logical thread between the various components of the programme and creating opportunities for teacher learning that are consistent. The content of effective professional development should consider both subject knowledge and subject-specific pedagogy in order to achieve the full potential of CPD, with clarity around learners’ progress. In addition, content and activities should help teachers understand how pupils learn, both generally and in specific subject areas. Effective professional development is associated with certain activities – these include explicit discussions, experimenting and testing ideas in the classroom and analysis of, and reflection around, the evidence and relevant assessment data. External input from providers and specialists must challenge orthodoxies within a school and provide multiple, diverse perspectives – facilitators acting as coaches and/or mentors should provide support through modelling, observation and feedback. Empowering teachers through collaboration and peer learning – teachers should have opportunities to work together, try out and refine new approaches and tackle teaching and learning challenges. Powerful leadership around professional development is pivotal in defining staff opportunities and embedding cultural change – school leaders should not leave the learning to teachers, they should be actively involved themselves. 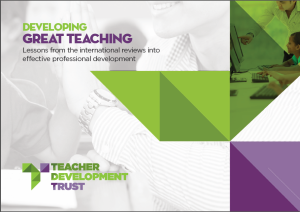 The Developing Great Teaching: Lessons from the international reviews into what constitutes effective CPD was commissioned by the Teacher Development Trust with support from TES Global. The research review was conducted by a team from Durham University, CUREE and the UCL Institute of Education using a variety of digital academic resources including FirstSearch, JSTOR, Google Scholar and others’ targeted reviews of CPD and teacher learning published since 2000. It provides the finest understanding yet of the lessons that can be taken from the international reviews into effective CPD. The initial search identified 947 “hits”, which were filtered using a series of screening processes designed to exclude any reviews of which the evidence base was not deemed sufficiently strong for inclusion. The remaining reviews were sub-categorised into four groups: a single study that was strong in multiple areas, a further three studies that were robust but more focused on particular areas of practice, another four studies that were less robust in terms of supporting evidence but tightly focused in the relevant areas and with systematic use of pre- and post-test data and one additional review included due to is claims being consistent with the broader evidence base. The reviews were analysed separately and their findings split into a series of claims, which were then compared and contrasted and weighted according to the strength of the evidence supporting them, before being grouped thematically. The Teacher Development Trust is the independent national charity for teacher training and professional development. Launched by teachers in 2012, the Trust works with government, schools and colleges, subject associations, teaching unions, universities, as well as many profit and non-profit organisations from across the education spectrum, both in the UK and abroad. The Teacher Development Trust is dedicated to improving the educational outcomes for children by raising the quality of teacher professional development, raising awareness of the importance of professional development and building tools to help teachers to transform their practice and achieve success for all their pupils. The Trust believes that demand for professional learning should be driven by the aspiration teachers have for the children they teach and the passion they bring to their work. The Trust is determined to bring about radical improvement in the quality of the ongoing training that teachers receive based on the evidence of what creates effective learning. Good CPD Guide: a national database of courses, consultancy services, books, videos and podcasts with teacher reviews and official quality ratings. This includes an official partnership with the Sutton Trust-EEF Teaching and Learning Toolkit goodcpdguide.com. The National Teacher Enquiry Network, a revolutionary approach to professional development, school improvement and teacher-led research https://www.tdtrust.orgtrust.org/teacher-enquiry-network/.